Many times we experience grief on this earth whether due to tragedies, disappointments, or sickness. Yet for those who put their trust in the Lord, there can still be peace and joy in the midst of it—not because we don’t hurt, but because God is with us. He becomes our refuge and hope to get through the difficult days. “A wicked person earns deceptive wages, but the one who sows righteousness reaps a sure reward” (Proverbs 11:18). Doing the right thing doesn’t always make us look good or feel appreciated. Sometimes doing the righteous thing will make other people hate us. Our choice is about God—His glory and honor is evident in our right decisions. There’s reward in this lifetime and the next when we press ourselves to sow righteousness. “Whoever sows injustice reaps calamity, and the rod they wield in fury will be broken” (Proverbs 22:8). Nothing we do is hidden from the Lord. When we choose to act in an unjust manner towards others, we will reap calamity or pain from it eventually. Many of us don’t recognize that sometimes we are suffering indirectly for things we’ve done wrong. The Lord is patient and wants each of His children to come to the place of dealing with injustice in our hearts and actions. “Do not be deceived: God cannot be mocked. A man reaps what he sows. Whoever sows to please their flesh, from the flesh will reap destruction; whoever sows to please the Spirit, from the Spirit will reap eternal life” (Galatians 6:7-8). We can deceive ourselves into believing that we won’t pay the price for sowing into our flesh. However, God knows and He will render due justice to each person on the earth. Destruction and eternal life are complete opposites—if we want eternal life and we need to take the correct actions of making the investment into spiritual decisions and/or disciplines. “Remember this: Whoever sows sparingly will also reap sparingly, and whoever sows generously will also reap generously” (2 Corinthians 9:6). Stinginess and hoarding should never be a part of a Christian’s walk. We are called to hold lightly to material things as a means for essential life necessities. However many of us are guilty for sowing our money sparingly towards God’s work, but generously towards our needs and/or wants. God pours out blessings on the faithful generous believers that are far more expansive than just money. He blesses with His presence filled with joy and peace in incredible generosity. “Then another servant came and said, ‘Sir, here is your mina; I have kept it laid away in a piece of cloth. I was afraid of you, because you are a hard man. You take out what you did not put in and reap what you did not sow’” (Luke 19:20-21). At the judgment seat of Christ, there will be tears of regret for many believers. They will make it into heaven because of their faith in Jesus, yet they will suffer loss because they sowed nothing with what God gave them. We are saved by Christ to do good works for the kingdom. Believers must use their gifts given to them from God to affect change in their families and communities. “Jesus told them another parable: ‘The kingdom of heaven is like a man who sowed good seed in his field’” (Matthew 13:24). 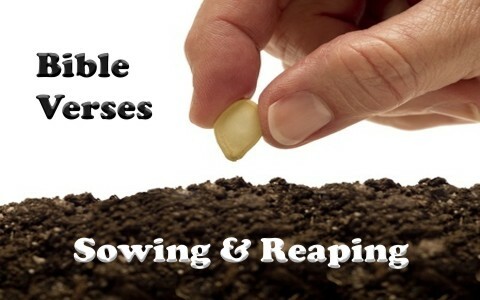 The man sowing is Jesus and the good seed are those who belong to the kingdom of God. The Lord has planted His people specifically where He can use their lives for God’s glory. We are meant to shine out of the worldly darkness with the light of Jesus Christ. Our words, actions, and attitudes reflect the beautiful transformation of knowing God and being known by Him. What are you sowing today? It’s not a matter if you think you are sowing or not. Step out of the deception and recognize that your life is one big field waiting for the right seeds to be planted. It’s best to take out a little time to do an inventory of your life. You can start with a small seed of determination to make a change and one day reap a huge dividend of eternal reward from God. Related reading: Are There Rewards in Heaven Based on How we Live on Earth? the word of the Lord is just awesome!